The life cycle of lupin from germination through to seed ripeness can be divided into six clearly definable stages. The first of these: germination and seedling development, is described here for narrow-leafed lupin. The lupin seed consists of a seed coat (also called testa) and embryo. The embryo is already a well developed plant consisting of two cotyledons, five or six leaf primordia on a tiny seedling axis and the radicle (embryonic root) (Figure 2.2). Cotyledons account for about 75% of the weight of the seed. The seed coat accounts for almost 25% of the weight. If too dry, lupin seeds can be brittle and vulnerable to damage during harvesting, handling and sowing. Cracks can occur in the embryo that may reduce seedling establishment and vigour. The point of attachment of the cotyledons to the seedling axis is particularly susceptible to damage. Loss of a cotyledon will reduce seedling vigour because cotyledons are the food store for the growing seedling. Cracks elsewhere in the seed embryo can lead to seedling abnormalities such as a missing taproot or upside down growth. After sowing into moist ground, lupin seeds imbibe water readily. The water content increases from about 10% for dry seed to about 60% at germination. During this time, the embryo swells and the radicle ruptures the seed coat and pushes through it. When the radicle is 5mm long, the seed is considered to have germinated. After germination, the radicle continues to grow downwards and firmly anchors the plant in the soil, while the remainder of the seedling pushes upwards through the soil. The radicle becomes the plant’s taproot. The seedling stem between the radicle and cotyledons is called the hypocotyl. The hypocotyl forms a downward hook to protect the growing apex of the seedling and cotyledons as they are pushed upwards towards the soil surface. A seedling is considered to have emerged when any part of it protrudes above the soil surface. When soil is moist and the temperature averages 15°C, emergence occurs about six to seven days after sowing seeds 4cm deep. Lupin emergence is called hypogeal emergence because the hypocotyl expands to push the cotyledons and growing apex above the soil surface. This differs from the epigeal emergence of faba bean and field pea in which the cotyledons remain where the seed was placed in the soil and only the stem above them (epicotyl) lengthens to protrude from the soil. The size of lupin cotyledons and the force needed to push them towards the surface makes lupin comparatively sensitive to soil crusting compared with species that have epigeal emergence. After germination, the hypocotyl hook straightens and the cotyledons turn green and expand further as the shoot apex continues to develop (Figure 2.3). The hypocotyl above the soil surface also turns green. Depth of sowing can be determined on seedlings by measuring the length of the white portion of hypocotyl above the root junction. 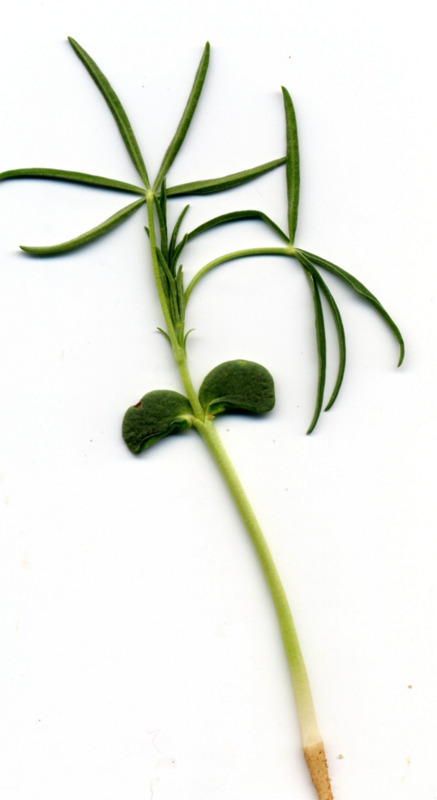 Because the cotyledons and shoot apex are above the soil, lupin is particularly susceptible to sandblasting, grazing and insect damage, compared to cereals, in which the shoot apex remains underground during vegetative growth. See Dracup and Kirby (1996) for more detailed information.